The Romans observed Saturnalia beginning December 17. When it comes to festivals, parties, and downright debauchery, no one beats the folks of ancient Rome. 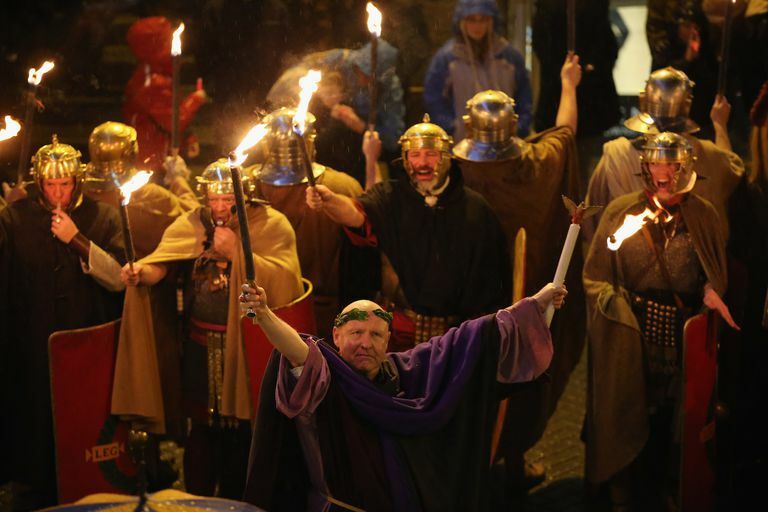 Around the time of the winter solstice each year, they celebrated the festival of Saturnalia. As the name implies, this was a holiday in honor of the agricultural god, Saturn. This week-long party typically began around December 17th, so that it would end right around the day of the solstice. Fertility rituals were performed at the temple of Saturn, including sacrifices. In addition to the large public rites, many private citizens held ceremonies honoring Saturn in their homes. One of the highlights of Saturnalia was the switching of traditional roles, particularly between a master and his slave. Everyone got to wear the red pileus, or freedman's hat, and slaves were free to be as impertinent as they wished to their owners. However, despite the appearance of a reversal of social order, there were actually some fairly strict boundaries. A master might serve his slaves dinner, but the slaves were the ones who prepared it — this kept Roman society in order, but still allowed everyone to have a good time. "Beginning in the week leading up to the winter solstice and continuing for a full month, Saturnalia was a hedonistic time, when food and drink were plentiful and the normal Roman social order was turned upside down. For a month, slaves would become masters. Peasants were in command of the city. Business and schools were closed so that everyone could join in the fun." Businesses and court proceedings closed up for the entire celebration, and food and drink were everywhere to be had. Elaborate feasts and banquets were held, and it wasn't unusual to exchange small gifts at these parties. A typical Saturnalia gift might be something like a writing tablet or tool, cups and spoons, clothing items, or food. Another popular present was the cerei, a tapered wax candle used in many temples and shrines. Citizens decked their halls with boughs of greenery, and even hung small tin ornaments on bushes and trees. Bands of naked revelers often roamed the streets, singing and carousing, as a sort of naughty precursor to today's Christmas caroling tradition. "When I retire to this garden summer-house, I fancy myself a hundred miles away from my villa, and take especial pleasure in it at the feast of the Saturnalia, when, by the license of that festive season, every other part of my house resounds with my servants' mirth: thus I neither interrupt their amusement nor they my studies." In other words, Pliny didn't want to be pestered by merrymaking, and was perfectly happy to indulge himself in the solitude of his country home, away from the debauchery of the city. Saturnalia was considered a holy day — after all, it was held in honor of a major god — and so a number of religious rituals took place during the festivities. According to early legends, Saturn himself was sacrificed, so in some areas, mock sacrifices of the god took place. In some temples, an ivory statue of Saturn was portrayed with linen or woolen bonds around the feet and ankles. During Saturnalia, these bonds were loosened to represent Saturn's liberation. This ritual was typically followed by an elaborate public banquet. "It is now the month of December, when the greatest part of the city is in a bustle. Loose reins are given to public dissipation; everywhere you may hear the sound of great preparations, as if there were some real difference between the days devoted to Saturn and those for transacting business....Were you here, I would willingly confer with you as to the plan of our conduct; whether we should eve in our usual way, or, to avoid singularity, both take a better supper and throw off the toga." In wealthier Roman households, the Saturnalicius princeps, or “leader of Saturnalia,” was selected from among the slaves. Similar to the custom of the Lord of Misrule in Britain, who appears around the Yule season, this person was responsible for organizing merrymaking and mischief during the celebrations. He was seen as the ruler of chaos, in direct contrast to the normal orderly manner of Roman life. In addition, he was in charge of making offerings to the Penates, who were Roman household gods associated with domestic life. "Meanwhile the head of the slave household, whose responsibility it was to offer sacrifice to the Penates, to manage the provisions and to direct the activities of the domestic servants, came to tell his master that the household had feasted according to the annual ritual custom. For at this festival, in houses that keep to proper religious usage, they first of all honor the slaves with a dinner prepared as if for the master; and only afterwards is the table set again for the head of the household. So, then, the chief slave came in to announce the time of dinner and to summon the masters to the table." The traditional greeting at a Saturnalia celebration is, "Io, Saturnalia!" with the "Io" being pronounced as "Yo." So next time someone wishes you a happy holiday, feel free to respond with "Io, Saturnalia!" After all, if you lived in Roman times, Saturn was the reason for the season! Should You Celebrate Thanksgiving? It's Up to You!